Insects buzz around you constantly, wanting a taste of the sweat that drips from beneath your helmet and soaks your clothes. People are suspended like spiders on a web above and below you. Exertion and adrenaline mix in equal parts. 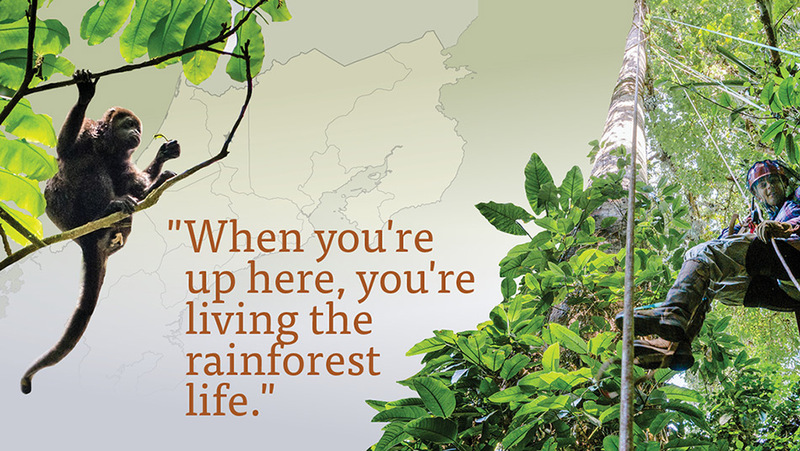 After all, you’re dangling from a rope 70 feet above the ground in a Costa Rican rainforest. We’re used to seeing a forest by looking up. But Professor Catherine Cardelús wasn’t content staying anchored to the ground. She thinks nothing of climbing up 100 feet or more into the jungle canopy. What’s she looking for? Epiphytes — plants that grow on other plants. To get to them, she fires a crossbow into the branches of trees that are nothing like those you might have climbed when you were young. The trunk of the giant Lecythis ampla, for example, towers above you, its lowest branch a dizzying 90 feet high. 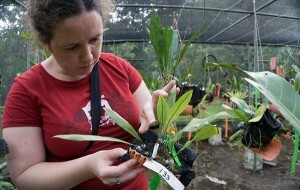 For the past five years, Cardelús has used this unique setting to design and carry out the first experimental study of epiphytes, essentially turning the jungle canopy into her lab. In the forest around La Selva Biological Field Station in Costa Rica, epiphytes grow with an astonishing abundance and diversity. From the farthest tip of a branch to the trunk, almost every inch hosts a plant, some not even as long as your finger, while others cascade down farther than you could reach. The density of plants growing in the treetops intrigued Cardelús from the first time she climbed a tree here as an undergraduate student. “I looked at a branch, and I had an entire other forest. 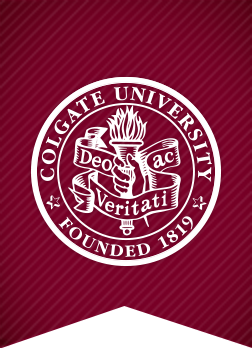 And I thought, holy cow, how does this function?” said Cardelús, now an associate professor of biology at Colgate. Her longtime colleague and friend — and a visiting professor — Carrie Woods, once found 65 different species of epiphytes in a single tree. Epiphytes include ferns, orchids, and bromeliads. They play a crucial role in the health of the rainforest ecosystem. But the difficulty of getting into the canopy means that they’re little studied — and often overlooked. Whole communities of species live in these plants. Some species of frogs and dragonflies will only lay their eggs in epiphytes. Some lichens, rare on the forest floor, grow richly on epiphyte leaves, and mites inhabit the shallow layer of organic soil that forms over time on the branches. The treetops may be the last place you’d think of soil forming, but the combination of large surface area and abundance of decaying organic matter on these massive branches produces a dark, rich layer with a composition distinctly different from the ground soil. Epiphytes also influence the trees on which they live by minimizing water loss and providing a source of nutrients to the forest floor. In the treetops, epiphytes compete fiercely for both nutrients and space to grow. Like all plants, they need nitrogen and phosphorus, and those in the canopy don’t have access to the vast nutrient pool found in ground soil. Instead, they are specialists at extracting the limited nutrients that arrive dissolved in rainwater or that land as dust on their leaves. But air pollution changes all this. Every day, a wide range of human activities, from industrial pollution to the burning of fossil fuels, pumps more and more nitrogen and phosphorus into the air, dramatically increasing the levels beyond what would naturally occur. 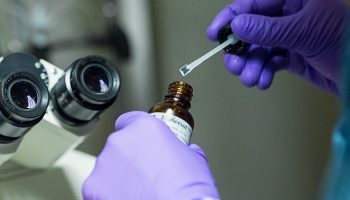 Research indicates that atmospheric nutrient levels will increase by 50 percent in the coming decades. 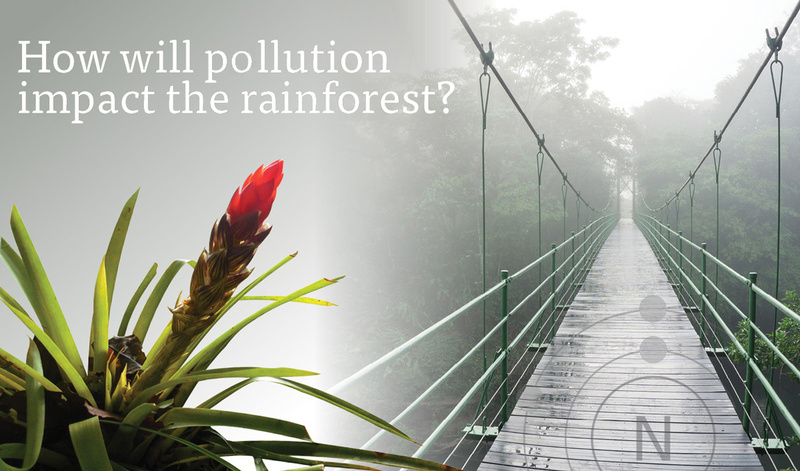 Cardelús and Woods predict that epiphytes, living at the interface between the atmosphere and the rainforest, could be the first to respond to changes in nutrient levels. Cardelús refers to them as canaries in the coal mine. More nutrients must equal more growth, right? It’s not that simple. Cardelús and Woods predict that epiphytes, living at the interface between the atmosphere and the rainforest, could be the first to respond to changes in nutrient levels. Rather than wait for pollution levels to rise, Cardelús had the ambitious idea to bring the pollution to the canopy — or at least, to 10 trees. She picked five trees each from two species that grow taller than most of the trees around them: Virola koschnyi, the nutmeg tree, and Lecythis ampla, a relative of the Brazil nut tree. 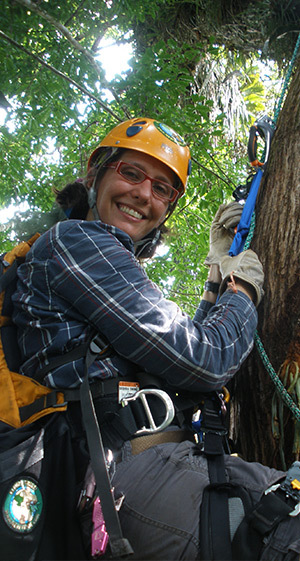 Cardelús can’t be in Costa Rica year-round, so she arranged for local field assistants to climb into the canopy every few days for five years. They hauled heavy canisters of rainwater premixed with 50 percent more nitrogen or phosphorus than normal, to spray on the branches. The five experimental branches in each tree received different treatments — excess nitrogen for one, phosphorus on another, both nitrogen and phosphorus together, partially blocking rainwater on the fourth branch, and finally, a control branch with no treatment. Each year, Cardelús and Woods have brought teams of student researchers from Colgate to assist with data collection. Along the way, the experience turns into broader lessons about the process of science, conservation, and the fragility of ecosystems. The students spend six weeks climbing the experimental trees to collect samples and assess the diversity, growth, and nutrient content of the canopy epiphytes, all to answer the pivotal question, how will pollution impact the rainforest? This past May, four Colgate student researchers landed at San Jose airport. Before landing, they hardly knew each other. A couple were world travelers, while the others proudly showed off their first passports. But the rainforest was new to all of them, and they all shared the same fears: snakes, heights, spiders, and an understandable anxiety about the next six weeks. At La Selva, the team has almost celebrity status. Everyone knows who the tree climbers are, and in no time, the students will adjust to their new role. Life in the rainforest and the canopy soon becomes second nature. La Selva field station sits in the midst of a tropical rainforest in the Caribbean lowlands of Costa Rica. Thousands of plant species, including about 700 different kinds of trees, represent every imaginable shade of green. The bird, insect, and animal life is equally diverse. The Puerto Viejo River separates the field station in two. The researchers’ cabins and laboratories sit on one bank. On the other sit the open-air cafeteria and the muddy soccer field, surrounded on all sides by dense jungle. The station’s iconic green suspension bridge spans the river, and from it, you never know what you’ll see: caiman, snakes, sloths, monkeys, iguanas, and any number of birds. For the students, this place is a crash course in what a tropical rainforest should be. Cardelús starts their rainforest education with a walk along one of La Selva’s bike trails, and points out the major tree families. Here, a tiny space hosts a massive variety of trees, so it takes them an hour to walk the length of a football field. The students crowd around to see every tree and leaf that Cardelús and Woods point out, soaking up their first venture into the forest as they learn about the distinctive branching pattern of the Myristicaceae family and the difference between the roots of the Welfia and Socratea palms. 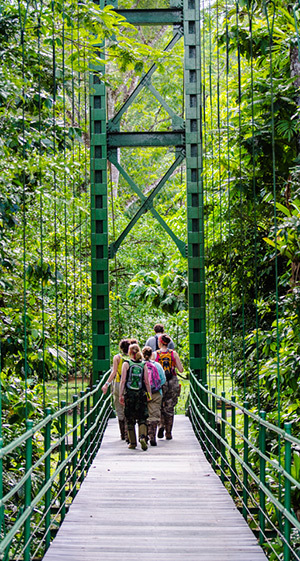 Cardelús is right — the rainforest makes an exceptional classroom. After that, the students challenge each other constantly to name plants, and are excited to point out the ones they know. But they have a lot still to learn. They haven’t yet climbed a tree. Days start early, and by 5:30 a.m., the air is thick with warm mist rising from the forest. The nighttime noises recede as the howler monkeys start calling to each other and the constant buzz of the insect day-shift begins. Over coffee, breakfast, and bird watching in the cafeteria, the team reviews the day’s plan. By 7 a.m., everyone has put on knee-high protective snake boots and stuffed the last scraps of gear into backpacks, already full with 40 lbs. of ropes, helmets, sample bags, pens, data sheets, food, and water. The target tree today is their tallest experimental tree, a giant Lecythis ampla, code-named LCC, and it’s almost an hour’s hike away, across muddy terrain. When they get there, guide ropes, made of banana twine and known locally as cocaleca, are already in place. The team uses them to pull the climbing ropes into place. Standing at the base of the tree, you see your rope reaching up and disappearing into the treetops. You hope that everything works like it should, but your mind still races over the possibilities — is my rope frayed, will my anchors hold? Cardelús and Woods never skip safety steps. They go through everything carefully with each person on the first couple of climbs. Soon, everyone has picked up the lingo, talking about Jumars, descenders, and locking carabiners while debating the finer points of the single-rope technique. They also learn a series of crucial knots: one for attaching two ropes together, another for anchoring to a nearby tree, and the figure eight for attaching the harness to the climbing rope. The students quickly learn to trust their climbing partners; everyone performs vital equipment checks for each other. It takes almost an hour before everyone is set up and ready to climb. Surprisingly, the hardest part of climbing is just getting off the ground. The elasticity of the rope means you have to haul the excess through your pulley system to take up the slack. You grunt and heave for ages before the rope finally pulls taut. By then, you’re exhausted but swinging just a foot off the ground. Only another 100 feet to go. But then, you find a rhythm — slide the ascender up, push your feet down, pull your hips up, feed the rope through the descender. And if you’re afraid of heights, don’t look down. Little by little, you start to climb. You leave the understory, push your way through the grippy liana vines, and inch your way upward toward the openness of the canopy. Each foot gives you a new perspective of the forest. All of a sudden, you’re looking down on plants that you’d previously only seen from below. Everyone climbs at their own pace, and all the way to the top, you can hear excited laughter and breathless exclamations of, “This is amazing!” Some even sing. It’s 30 minutes later, and you need one last effort to swing your leg over and pull yourself up so you’re straddling the giant branch of the massive Lecythis ampla that the team affectionately named Blanche. You let your heart rate settle, sip some water, and take it all in. The grueling climb rewards you with a view few people will ever see. You’re looking out across a sea of treetops with a new world of birds and butterflies, the feel of the sun, the scent of the flowering trees, and a forest of epiphytes covering the branch you’re sitting on. “I remember how awesome it was the first time I went up,” Woods said, “When you’re up here, you’re living the rainforest life.” The adrenaline makes it easy to forget that the climb is just the means of getting to work. Now the hard part begins. The researchers collect a massive amount of data, looking at every plant from the trunk to 6 feet out, often numbering more than 100 on a single branch. They count the number of leaves, measure the longest one, and collect content later. The students quickly learn to distinguish an Anthurium upalaense from an Elaphoglossum latifolium, with Lindsay calling out: “Look for an Ela lat, number 76, and get a leaf sample!” Sometimes the plants are within an arm’s reach, but often the researchers contort themselves like trapeze artists in suspended animation, horizontal in midair, just to measure a couple of leaves. The canopy has other dangers as well. Massive bullet ants are everywhere; their bite feels like a gunshot. Monkeys can chew through ropes, so if they leap into your tree, you need to descend fast. And the gusty afternoon wind can blow trees down — something especially disconcerting if you’re perched in one yourself. On a good day, the researchers finish a branch in five painstaking hours. Thankfully, the end of a branch usually signals the end of the day, and getting down is a lot easier than getting up. With just a flick of the descender, it’s a quick zip back to the forest floor. The stress and exhaustion of several consecutive days’ climbing takes its toll. Emotions run high at times, but the group rapidly molds into a team. As the weeks progress, they give each other needed encouragement when fears, heat, humidity, or vicious biting ants threaten. Collaboration and teamwork underlie the whole project. For Cardelús and Woods, their complementary approaches are what make this 10-year collaboration work so well. Woods began as Cardelús’s field assistant, but now they’re scientific confidantes. Because so few people work in the canopy and understand how the ecosystem functions, they use each other as sounding boards. “When we work together,” Cardelús said, “we work exponentially better than either of us would work alone.” And they push each other — hard. Treetop sample collection comprises only a fraction of the work. 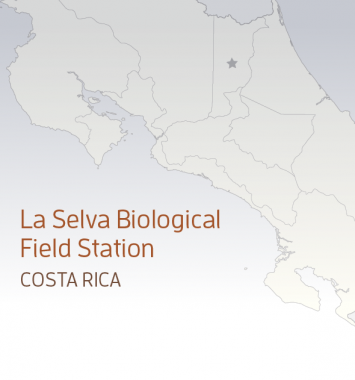 The team spends countless hours processing samples and analyzing data both at La Selva and back at Colgate. Cardelús ensures that each student learns every angle of the project. They establish a punishing schedule to get it all done. Cardelús and Woods set the standard, grabbing takeaway field lunches even when they’re not in the field to save time walking to the cafeteria. When you step inside the well-equipped labs at La Selva, the shock of the air conditioning makes you temporarily forget that you’re in a rainforest. Here, the students meticulously separate the twigs and detritus from the rich organic canopy soil and learn the chemistry to analyze the soil’s nutrient content. In the outdoor ambient temperature labs, they run experiments on plants growing in a modified greenhouse, known as a shade house. The students learn to use a finicky Li-Cor machine to measure photosynthetic light curves, and every plant in the shade house needs measuring. The shade house feels like a small secret garden, a jungle within a jungle. The mesh walls slightly muffle the sounds outside and mimic the shade of the high canopy by letting in only 20 to 30 percent of the daylight. By comparison, the forest floor sees only 5 to 10 percent of sunlight. More than 50 epiphytes hang suspended from the ceiling in their own little pockets of canopy soil; they receive the same nutrient treatments as their canopy counterparts. Woods maneuvers between the hanging plants, carefully examines each one, and touches them like they’re old friends. She takes pride in the shade house, her pet project. For the last two years, the field assistants have tracked the growth of each leaf and flower on every plant. Woods points to one that grew 10 leaves in one year, each leaf measured and recorded. This level of detail has never been documented before. Between the shade house and canopy, the volume of data will keep the researchers busy analyzing and publishing for a long time to come. Cardelús always looks to the future. Her first climb got her hooked. She even got married in one of her experimental trees (her husband is fellow Colgate biology professor Eddie Watkins). Now, she says, it’s how little we know about epiphytes and their role in the health of the rainforest that keeps her coming back. “What rainforests do is important to us in terms of the way they cycle water, the way they cycle nutrients, and we threaten that rainforest by the way we consume, how much we overconsume.” As she speaks, a giant iguana wanders past the shade house, skirting around the watchful peccaries, while an emerald basilisk surveys the scene from a nearby tree. Inspiration for conservation comes easily in this place. The challenge is to make that feeling stick, and Cardelús constantly searches for more effective ways to drive her message home. 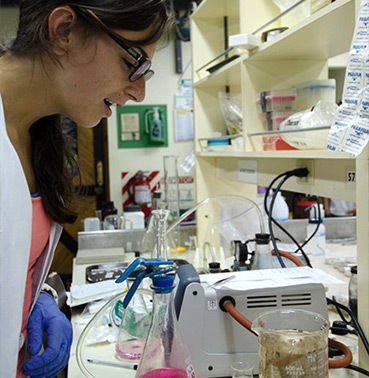 At the La Selva lab, Lindsay McCulloch ’16 analyzes soil samples collected from the rainforest canopy for their nutrient and bacterial content. First and foremost, Cardelús leads by example. She insists on using a single plate at dinner to minimize her own contribution to the dirty dishes. Whether or not the students followed suit, they all noticed and likely thought twice about their own actions. “I show my students that small things can make big differences,” she said. 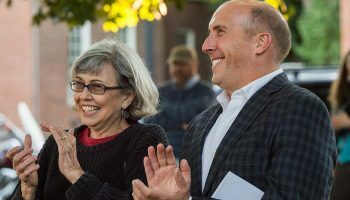 She also works on projects in forests in the Adirondacks and Ethiopia, leads the sustainability program at Colgate, and teaches a course that tackles related issues on campus. 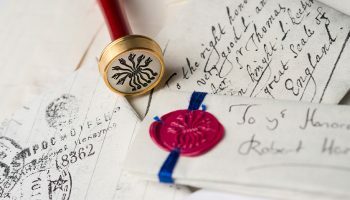 The project began with a leaf, only an inch long, of one tiny epiphyte, sprouting from the side of a branch on a tree in the middle of a rainforest. Five years later, and countless exhausting hours of work from dozens of people, the research team now has thousands of data points. But the project has come to an end, and this year’s students measured the last leaf, dismantled the shade house, and climbed the trees for the last time. Hey Carrie, very informative post. It will help many people to explore their knowledge.